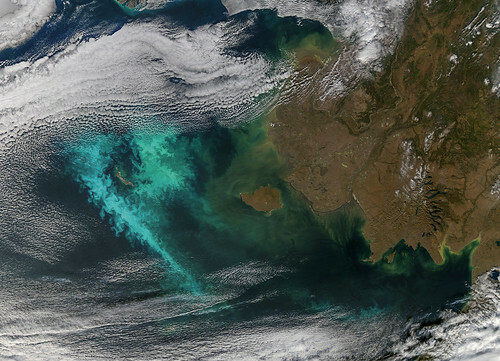 Large blooms of phytoplankton (likely coccolithophores) surrounded the 51-kilometer-long St. Matthew Island in the Bering Sea on October 8, 2014 when the above Aqua-MODIS image was collected. The swirls and eddies of color give some indication of the turbulent nature of these waters. The reflective blooms have been visible from orbit for a few months now.